Key Democrats on Capitol Hill worry that the $66 billion deal to merge southern banking giants BB&T (BBT) and SunTrust (STI) will create a “too big to fail” bank. 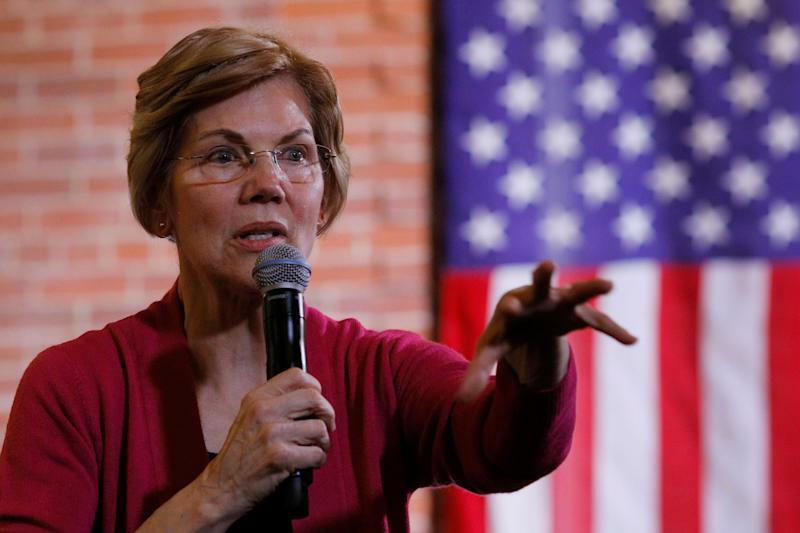 Sen. Elizabeth Warren, the Massachusetts Democrat with ambitions in 2020, wrote to Federal Reserve Chairman Jay Powell on Thursday expressing concern that the Fed will simply green light the pending merger without considering the effect of the deal on bank competition. The combined entity, if the merger is approved by regulators, would be the sixth-largest bank in the U.S.
“The Board’s record of summarily approving mergers raises doubts about whether it will serve as a meaningful check on this consolidation that creates a new too big to fail bank and has the potential to hurt consumers,” Warren wrote. Warren wrote that she fears regulatory changes could “make matters even worse” and cited Yahoo Finance’s reporting on favorable conditions in the bank M&A space that could spur more industry consolidation in 2019. Banks not only have considerable holdings of cash thanks to the tax cuts, but they benefited from a new law passed in May 2018 that reduced regulatory requirements on banks with between $50 billion and $250 billion in total assets. Currently, BB&T has about $226 billion in total assets while SunTrust has $216 billion. The Fed also elected to loosen some liquidity standards on banks between $250 billion and $700 billion, making for a slightly easier operating environment for the likes of U.S. Bancorp (USB), PNC Financial (PNC), and the proposed SunTrust and BB&T entity — which has yet to be named. Yahoo Finance had reported that these factors — in addition to pressures to create scale in order to build digital platforms that can compete against the big four banks — have brought banks with between $50 billion and $200 billion to the negotiating table. And with the SunTrust and BB&T deal now in the works, the race to consolidate may have begun. Warren warned the Fed to carefully work through BB&T’s and SunTrust’s application and communicated her concerns over the Fed’s “high rates” of M&A merger applications. Per normal protocol, the Fed will consider a number of factors before it approves the deal, such as the impact of the merger on communities that the banks exist in and its compliance with Bank Secrecy Act and Anti-Money Laundering statutes. BB&T currently faces an outstanding consent order with the Fed, but BB&T Chairman and CEO Kelly King said the company is in the “final stages” of resolving the issue. “We do not expect it to stand in the way of this combination being approved,” King said on the deal announcement call. 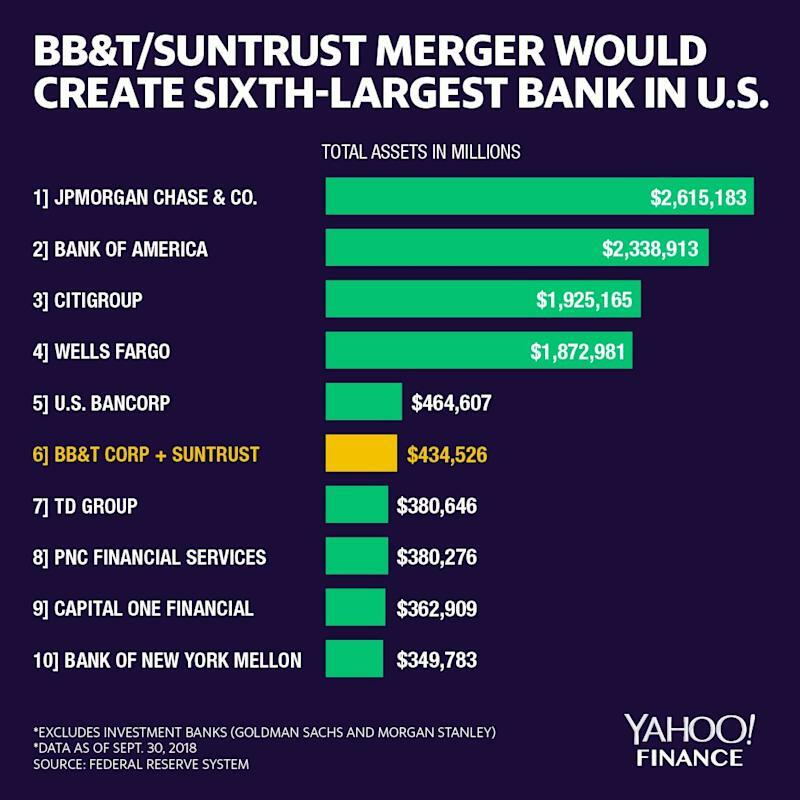 Isaac Boltansky, director of policy research at Compass Point Research, told Yahoo Finance the BB&T and SunTrust deal shows “just how much the post-crisis regulatory regime has changed,” but said he wouldn’t be worried about the largest Wall Street banks merging. “I think federal regulators will remain frosty to the idea of money center bank M&A, but the policy landscape for regional and super regional banks has improved in recent years,” Boltansky said. Warren is not the only one on Capitol Hill expressing concern. Maxine Waters, the California Democrat at the head of the House Financial Services Committee, issued a statement claiming that the BB&T and SunTrust merger is a “direct consequence of the deregulatory agenda that Trump and Congressional Republicans have advanced.” The bill actually had the support of a number of moderate Democrats in both the Senate and the House, although both Waters and Warren voted against versions of it.